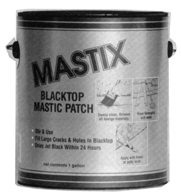 Mastix is the easy repair solution for alligator-cracked asphalt and deep puddle areas in pavement surfaces. It will harden as it dries and will become traffic stable. Cracks wider than 1/2 inch should be filled with hot pour crackfiller. Mastix is a bituminous pre-mix of mineral aggregate that is uniformly coated with a suitably designed bituminous binder. The material is workable and is capable of being spread and raked under normal conditions. Ductile asphalt combined with compatible components that require no modifications or heat to apply. Processed with uniform proportioning and heat control. Preservative added. Keep this product from freezing. Remove dirt and loose material with a stiff brush, air or water. Lightly dampen area; do not leave standing water in the area. Do not apply when rainfall is expected or air temperature is expected to fall below 45°F (7°C). Open to traffic only after a 24-hour curing process. Not recommended for steeply inclined driveways as the surface may become slippery when wet. Mastix should be applied in layers to assure uniform drying. Spread with a trowel or putty knife. Press firmly into decayed area and allow to dry sufficiently to touch. Not designed to be applied over 2 inches thick and should be applied in layers. If more than a 2-inch thickness is needed, use Extendit's Cold Patch pavement repair product. Seal with X-10 Sealer when completely dry. Read SDS and safety warnings before use. Dried Mastix is insoluble in water. Clean up equipment and spills before the Mastix dries, if possible with water and/or soap. If Mastix has dried, use coal tar solvent cleaner. One gallon covers approximately 3 square feet by 1/2-inch deep.